Suphas Number 1 on Trip Advisor in Plymouth! We are delighted to now be number 1 on Trip Advisor for Restaurants in the Plymouth area! We’ve got something very special happening: Supha’s Sunday Seafood Special on Sunday 24th July 2016. Please note: Advanced booking is essential. See full details below. CHEF SPECIAL: Supha and Jack Marchal will be wok-ing up a storm, with other foody specialists on the day Supha will be joined by renowned French chef Jacques Marchal, Crabstock Festival founder Adrian Bartlett and Nick from Moby Nicks our fresh fish supplier to bring you an afternoon of mouth-watering seafood delight. There will be a demonstration on crab-picking from Adrian, while Supha and Jacques will be in the kitchen, wok-ing up a storm. SomTam Girl will show how to make a fiery salad with the pestle and mortar, with Nipa demonstrating the delicate art of fruit carving. Then it’s your turn. Just sit back with a drink and sample a selection of seafood dishes freshly prepared for you, and enjoy the afternoon by the quayside. We have limited spaces for this fantastic afternoon so booking is essential. An imaginative new food experience bringing freshly cooked street food to Plymouth has opened on the waterfront in Sutton Harbour. 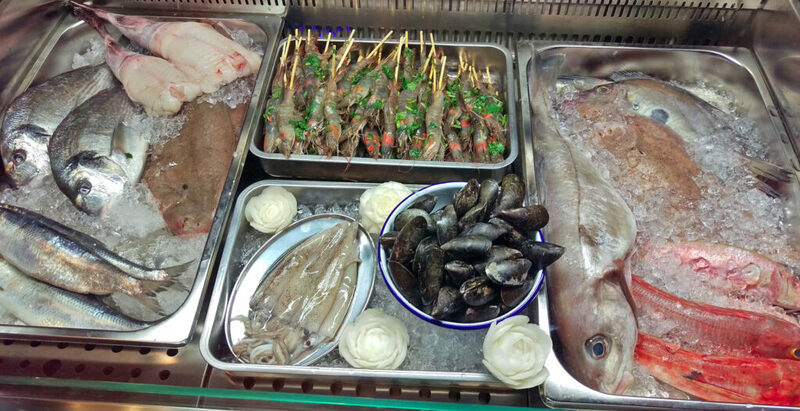 Street food emporium Supha’s offers an Asian-style menu cooked to order in an open kitchen with fresh fish, sourced daily from nearby Plymouth Fisheries, kept in a wet counter for customers to choose from. The relaxed dining environment also enjoys spectacular views of Plymouth’s wa-terfront from its prime position at East Quay House in Sutton Harbour, close to The China House pub and overlooking the marina and historic harbour. Supha’s officially opened to the public on Thursday, February 11th and will be open from Wednesday-Saturday between 12noon and 10pm, and on Sundays from 12noon until 9pm. The venue is the brainchild of Plymouth entertainment entrepreneur and events organiser Dan Thompson and his partner, experienced Thai chef Suphawadee Kaden. The couple co-created Supha’s, pronounced ‘supers’, which is named af-ter Suphawadee. Dan Thompson, co-creator of Supha’s, said: “We are delighted to finally be open, and looking forward to offering something totally new for Plymouth in a very untraditional format with a bright, colourful dining area, and an open kitchen so diners can talk to the chef directly and explain how they’d like their meal to be cooked. “The emphasis will be very much on serving up seasonal produce and sharing fresh food with street-food style cooking and strong Asian influences including Thai cuisine as well as dishes from Malaysia, Laos, Myanmar and Vietnam. “There is an extensive vegetarian selection and lots of our dishes are naturally gluten free too. Paul James, Asset Manager for Sutton Harbour Holdings plc, said: “It’s fan-tastic to see Supha’s open in Sutton Harbour bringing something completely new to Plymouth, and offering a very innovative new food experience for the city thanks to the vision of Dan and Suphawadee. A trailblazing new food experience is opening on Sutton Harbour in a prime position on Plymouth’s spectacular waterfront. 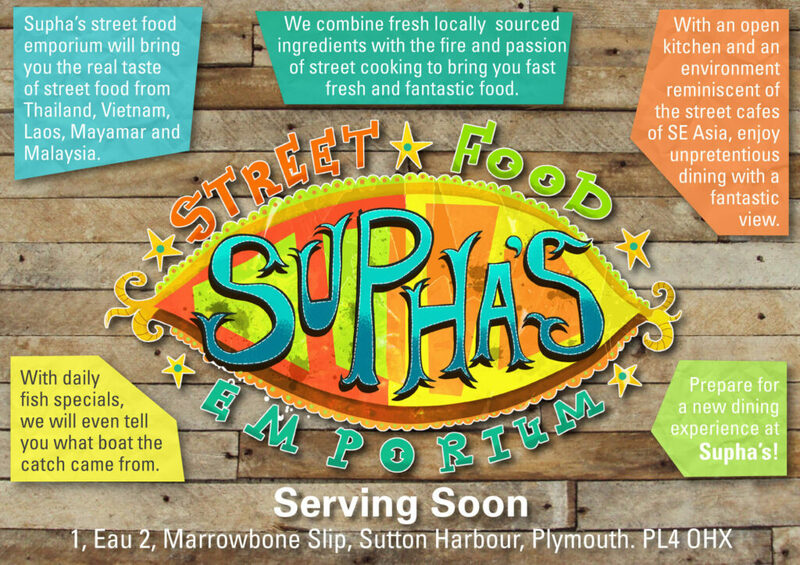 Supha’s will be a street food emporium offering relaxed dining with a Asian-style menu, an open kitchen and fresh fish sourced daily from nearby Plymouth Fisheries and kept in a wet fish counter, so customers can pick their fish to be cooked. The imaginative new concept is the brainchild of Plymouth entertainment entrepreneur and events organiser Dan Thompson and his partner, experienced Thai chef Suphawadee Kaden. The couple have co-created Supha’s, pronounced ‘supers’, which is named after Suphawadee, who has previously worked in many leading local restaurants. Supha’s will be based in a ground floor unit at East Quay House in Sutton Harbour, close to The China House pub, with enviable views across the harbour and the historic quarter of Britain’s Ocean City. Dan Thompson, co-creator of Supha’s, said: “Suphawadee and I are very excited about opening Supha’s in such an amazing location with one of the best views of any food establishment in the city – diners will be able to sit outside next to the water and watch the sun set over the harbour. “What we are trying to create is totally unpretentious dining; nothing about Supha’s will be like a traditional restaurant. It will be a very bright, colourful and relaxed environment with an open kitchen so diners can talk to the chef directly, and an emphasis on seasonal produce and sharing fresh food. The menu will have a street food-style and strong Asian-influences with predominantly Thai cuisine, as well as dishes from Malaysia, Laos, Myanmar and Vietnam, and an extensive vegetarian selection. Dan and Suphawadee hope to open Supha’s in December, subject to preparations being completed in time. Dan is well-known in the city for his work managing major city events such as the Barbican International Jazz and Blues Festival, Plymouth University’s graduation ceremonies and the Respect multi-cultural festival. Dan also created and co-owns the B-Bar at the Barbican Theatre, and owns events company Kaos Production Ltd.
Paul James, Asset Manager for Sutton Harbour Holdings plc, said: “This prime unit at East Quay House is a very special space with breath-taking views across the city’s waterfront, and we are delighted that it has been taken over by the visionary partnership of Dan and Suphawadee, who are creating such an innovative new food establishment for Plymouth. Find out more about Supha’s at www.suphas.co.uk.